Millions of people are expected to flock to Oregon, Montana, Nebraska and 11 other states to catch a glimpse of this summer’s total solar eclipse. UO astrophysicist Scott Fisher will be one of those people and advises others to do the same for the Aug. 21 event. He will discuss why he thinks it’s a bright idea to be in the path of totality when there’s darkness in daytime and will breakdown the science behind the eclipse in a Wednesday, Aug. 9, Quack Chats pub talk. Fisher will explain why this phenomenon exists and what to expect when the moon becomes the sky’s starring act during his talk “Darkness in Daytime: The Science of the August Eclipse.” Fisher will also cover good safety practices for eclipse viewing and share his plans for the eclipse with the audience. Fisher will dive into all of those features of the eclipse and much more. The pub talk is free and open to the public and will begin at 6 p.m. at Falling Sky Pizzeria in the Erb Memorial Union. Participants are welcome to bring questions, as the talk is intended to be more of a conversation than a lecture and audience participation is encouraged. The eclipse will travel across the entire continent, but its first landfall is in Oregon, where it can be seen within a band about 60 miles wide and including Corvallis, Prineville and Baker City. Including this Quack Chat, Fisher will be leading three different discussions in Eugene and Portland to give people the lowdown on the low-light event. 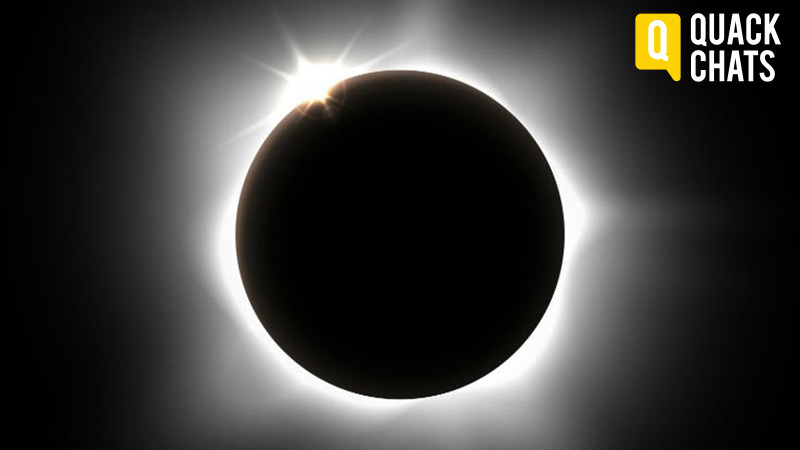 All of the events and more information about the eclipse from UO experts can be found in a recent story on Around the O.
UO particle physicist James Brau will also be leading discussions to educate the public about the solar eclipse. The first is a talk at the Eugene Public Library at 6 p.m. Aug. 16 that will help audience members understand the science behind the solar eclipse. He will also be delivering a speech on solar science at the OMSI Solar Eclipse Viewing Party in Salem, but the event, like many eclipse attractions and lodging options, has been sold out for months. A handful of UO students will join Brau at the OMSI event to present information on their collaborative research with the Laser Interferometer Gravitational Wave Observatory — better known as LIGO — that has detected gravitational waves, which are ripples in the curvature of spacetime caused by massive disturbances in the distant universe. Run with a Researcher, another opportunity to engage in discussions with UO researchers, returns this Saturday, Aug. 5. Participants can run or walk with a researcher by meeting up at 9 a.m. at the Erb Memorial Union’s “O” Desk. All paces are welcome. No advance registration is required. To help keep upcoming events on your calendar, see the Quack Chats webpage.